"Ma," said Hosh, "I've been thinking of the delicious taste of Chaach ever since I've had it." "Can we make it again today? Are there any variations of it that are as tasty, yet quick and simple to make?" "Like most milk products," answered Isha, "all Dahi derivatives are healthy, versatile, nutritious, and delicious." "You can serve them plain or flavored to almost anyone, anywhere, anytime. They are also all cheap, fast and easy to prepare." "Dried whole spices (and sometimes also other fresh ingredients such as chopped ginger root, garlic, fresh curry leaves, chilies or even sugar) are fried briefly in oil or ghee to liberate essential oils from cells and enhance their flavours." "This fried mixture may be prepared at the beginning of cooking, before adding other ingredients for a curry or similar dish, or it may be poured, together with the oil, into a dish after it has been cooked and is ready to be served (as with a dal, sambar or stew)." "Also called chaunk (छौंक) in Hindi, it is sometimes spelled as chhaunk, chounk, chonk, chhounk, or chhonk. It is also called tadkaa or tarka in Bengali (তড়কা) and Punjabi (ਤੜਕਾ), and Baghaar (also sometimes pronounced as bagar, baghara or vaghaar) in Urdu (بگھار), Bengali (বাগার), Gujarati (વઘાર) and Oriya languages." "Wow!" said Hosh, "it is popular then. And has many names like Chhaach itself did." "Yea," she continued, "It is also called Fodni or Phoron in Marathi (फोडणी), Bengali ফোড়ন), and Konkani (फोण्ण). In Tamil, it is Thaalithal (தாளித்தல்), Oggaraṇe (ಒಗ್ಗರಣೆ) in Kannada, Thalimpu (తాళింపు) or Popu (పోపు) in Telugu, and ..."
"Ok, ok, Ma!" interrupted Hosh, "I get it. I want to see you make it now. Its popularity is making me all curious and hungry." "Typical Ingredients," she smiled, "used in tempering any dish are Jira (cumin seeds), Rai (black mustard seeds), Saunf (fennel seeds), Hari Mirch (fresh green chilis), Laal Mirch (dried red chilis), Methi (fenugreek seeds), Heeng (asafoetida), Cassia (Cinnamon), Laung (cloves), Urad dal, Curry leaves, Pyaaz (chopped onion), Lehsoon (garlic), or Tejpat (Indian bay leaves)." "When multiple ingredients are being used to prepare Tadka, add them to hot oil in succession, with those requiring longer cooking added earlier, and those requiring less cooking added later." "When making my recipe of Tadka Chaach (or Tadkewala Matthaa), I tend not to use any ice or chilled water as I believe it kills the tang, fresh crunch and pleasing warmth of the chaunk in buttermilk." "But I know that many people take it on the rocks, or served it chilled. Try both, and you'll discover what better suits your taste." "Blend all the Mattha ingredients," she instructed, when he had assembled all ingredients, "in a food processor or blender for a few seconds. You don't want to blend Dahi too much, or it loses its texture." "Now heat ghee or oil in a pan. Add cumin seeds to the oil first. When they start to blacken, add mustard seeds. Let them start to splutter. 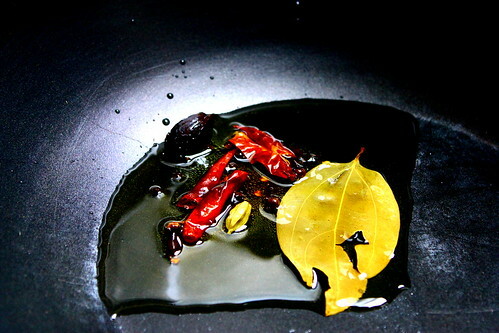 Then add the rest of the tempering ingredients to the oil." "Cooking the tempering mixture takes no more than 2-3 minutes on high heat. Pour this on Chaas and mix well. Garnish according to preference and serve fresh." "Can I use powdered or dried mint, Ma" Hosh asked, "if I can't get fresh mint leaves?" "Can do," she answered, "although the flavor and taste of fresh leaves is quite different. In fact, it is best to freshly roast Jira too, before using, as the aroma of freshly roasted cumin seeds is quite exotic. People use stored roasted cumin powder, but it loses quite a lot of its aroma over time." "Can I prepare Tadka Raita," Hosh asked, "using the same method Ma?" "Sure can," she replied, "You are learning to experiment now. That shows confidence. Tempered Yoghourt is great as a mains as well as side dish. The only difference in preparation of Raita and Mattha is that you don't water down curd too much to make Raita. I make Tadka Raita by tempering undiluted Dahi straight, using the same ingredients and recipe as we used in making Tadka Chaach." Hosh took one sip of the drink he had prepared. Then licked his lips clean, closed his eyes and murmured, "Mmmm...!" She smiled and left him alone in the kitchen to savor his handiwork.